1 volume (various pages) : color illustrations, color maps ; 29 cm. "Geography: Realms, Regions, and Concepts, 16th Edition helps readers build and develop their "mental map" of the world around them. Topics covered in this text are diverse and the skills, concepts, ideas, and terms that students are expected to learn are numerous. 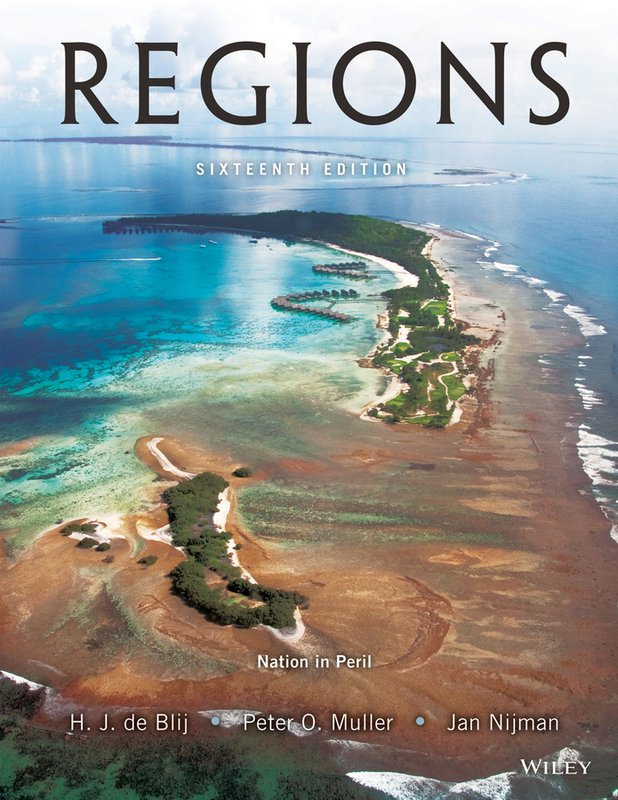 Regions is a time-tested and carefully crafted text with a long history of authority and dependability. The continued focus on creating strong and effective content and technology to empower learning allows instructors to structure their students&apos; learning experience both inside and outside of the classroom. A robust suite of resources, assignments built around raw data, and map quizzes/tests encourage interaction at multiple cognitive levels. Having this interactivity built around "tried-and-true" content will help readers construct and explain their "mental maps" of the world while furthering their understanding and application of important concepts, ideas, and terms. " -- Provided by publisher. Geography : realms, regions, and concepts / Harm de Blij, John A. Hannah professor of geography, Peter O. Muller, senior professor, Department of Geography and Regional Studies, Jan Nijman, professor of Urban Studies, University of Amsterdam, professor Emeritus of Geography, University of Miami. 100 ME:PersonalName 1 $a Personal name De Blij, Harm J. $c Statement of responsibility Harm de Blij, John A. Hannah professor of geography, Peter O. Muller, senior professor, Department of Geography and Regional Studies, Jan Nijman, professor of Urban Studies, University of Amsterdam, professor Emeritus of Geography, University of Miami. 250 Edition $a Edition statement 17th edition. 500 General Note $a General note Reserved till April 2019. 650 Subj. 7 $a Topical heading SCIENCE / Earth Sciences / Geography. 700 AE:PersName 1 $a Personal name Muller, Peter O. 700 AE:PersName 1 $a Personal name Nijman, Jan.
$a 776 De Blij, Harm J.